“Churches come in all shapes and sizes; they’re not better or worse than each other, they’re just different. But something can happen in every church everywhere. Even as we participate together in our worship services, we can still feel very alone… even here, in our church. Good people can attend church for months, even years and never really be known by anyone. Many choose to hide in the larger crowd, and we’re not criticizing anyone for that, but some of us really need to build stronger relationships, and we know it. Small groups are formed when more intimate gatherings of people meet together, formed around the understanding and application of God’s Word. Our JOYS, our CHALLENGES and our DISAPPOINTMENTS all have one common thread… we were never designed to go through them (ALONE). “We were never designed to go through them… alone. Here at Kirkmont we’re beginning a new series called “GO SMALL TO GROW BIG”; and we’re talking about the power of small groups… and we’re discussing the idea of whether or not we really were meant to go through this whole thing called LIFE “alone”. The video claims we weren’t meant to do ANY of it alone. 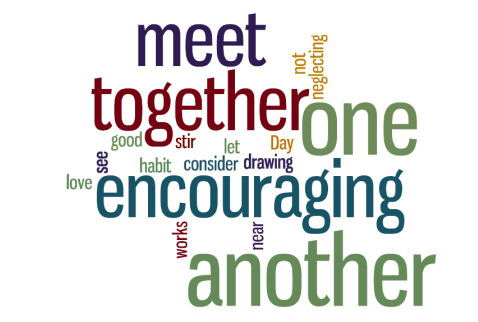 We’re going to be discussing this morning the idea that GOD CREATED US TO BE IN COMMUNITY… to be in close relationships, to have connections with others. Now we might be able to survive PHYSICALLY without those things; our BODIES might be able to survive without close relationships and without small groups and without connections; but here at the church we gather together under the understanding that God has given us not only a body but also a SPIRIT as well. What if I was to tell you that COMMUNITY was like OXYGEN FOR THE SOUL; or that Christian friends were like WATER FOR THE SPIRIT; or that a Small Group was like FOOD FOR THE SPIRITUAL ‘YOU’. You were not created to be without that type of community. Our physical body might survive, might even thrive but not the spiritual us. I mean we get this in other areas of life don’t we… we get it when it comes to PHYSICAL areas of life; and if we decided we wanted to grow physically to get in better shape physically we might do things to surround ourselves with like-minded people. It’s the reason why so many people join a gym… to surround themselves with people who have similar goals… who are like-minded, who are working hard. They get the power of joining the right community to accomplish the goal of their physical body. We have this fad of hiring personal trainers and meeting together in small groups, exercise groups and getting personal training in that way to help improve the condition we are in physically. We have a movement of people who are wanting clubs that offer CLASSES because we like the idea of getting together with a smaller group of people who are trying to accomplish some of the same things and getting our BODIES in shape. We get the importance of COMMUNITY when it comes to the PHYSICAL world. We understand that our College Campuses across the country have “Buddy Systems” to make sure that when our college students are walking around at night they’re kept SAFE because they’re in a community, they’re with someone else. How many of you have ever watched The Discovery Channel… we see this in nature as well. When a pride of lions is trying to take down a gazelle… and there’s a whole pack of gazelles or whatever you call a whole bunch of gazelles together… WHAT GAZELLE GETS EATEN? … the one that gets separated from the rest of the group… the lions charge in and everybody starts running and the gazelle that inevitably is the one that gets eaten is the one that ultimately gets separated from the rest of the group. So the next time you’re watching the Discovery Channel… in fact, let me rephrase that, you’re homework this week is to watch the Discovery Channel and to find a group of lions eating something, or trying to eat something and the next time you see them successful because they’ve separated one of the animals from the rest, I want you to say, “THAT’S WHAT THE DEVIL IS TRYING TO DO TO ME… and I am in serious danger because I am not a part of a community, because I’ve either left the community, or I’ve never been a part of one and I want the RED FLASH to go off and to say, “I might benefit from being part of a pack of like-minded people”. WHAT IS IT that makes us think we can do the God-thing alone? What is it that makes us think that we can get through life and have the “Spiritual-us” THRIVE and do it all alone? Is it PRIDE? … is it ARROGANCE?.. it must be… that makes us think that we can accomplish those things all alone without the help and benefit of other people around us. MAYBE YOU MIGHT BENEFIT from a SMALL GROUP… or LIFE GROUP, or CELL GROUP, or HOME GROUP or whatever some people might be accustomed to hearing it called. Maybe, you might benefit from one and perhaps someone might benefit from you being in one. That’s a big thing we want you to be thinking about this morning as we leave here this week. We’re going to look at a variety of Scriptures this morning quickly and just to see how God is calling us into a Community of Faith. 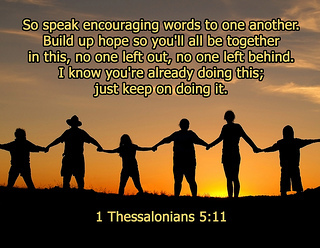 Now we pastors are accustomed to using that verse as a means of motivating people to come to church… I’ve used it myself to motivate people to come to church… “Let us not give up meeting together”… there’s certainly nothing wrong with using that verse for that purpose. But if we look at the Church back then, churches back then probably resembled a lot more like Small Groups today than churches today, where we have hundreds of people gathered together in buildings with HIGH CEILINGS and STAINED GLASS WINDOWS and CHRISTIAN EDUCATION WINGS, public restrooms, practicing praise teams and all that kind of stuff…. BACK THEN THEY HAD NONE OF THAT. They had no public facility that they might gather together, they MET IN HOMES, they tried to find homes that would fit 25-30 people in them, and they met in those homes. Now I’m not saying if you host a small group we’re going to try to put 30 people in your Living Room (smiles)… we’re looking for more like 10 or 12; but you get the idea. Nonetheless, the Early Church back then, the author of Hebrews is writing and he says, “Let us not give up meeting together”... what he’s saying is, “Don’t stop gathering in that type of a context”. Early Church back then looked much more like a small group today than a church today. 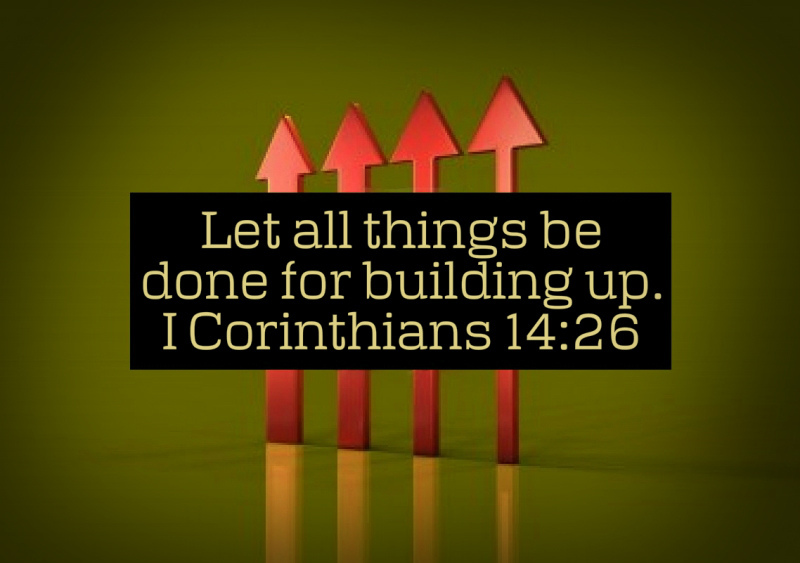 “Therefore encourage one another and build each other up, just as in fact you are doing”. 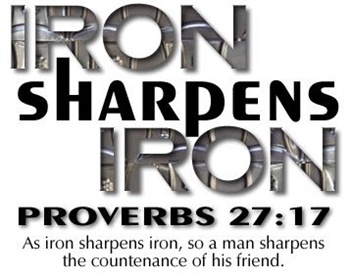 He wants us to “spur one another on“, as Hebrews said; He wants us to “encourage each other”, as 1st Thessalonians says; He wants us to “sharpen each other” as Proverbs says; He wants us “to experience UNITY with each other as the Psalms said; He wants to “bear each other’s burdens” as Galatians said; He wants us to “confess our sins to each other” as the Book of James told us; and as 1st Corinthians said, “we’re supposed to build each other up”. That just a small sampling of the things that God wants us to experience by being in community with each other. I want to ask you this morning, when is the last time you felt like you were genuinely encouraged by a Brother or Sister in Christ? For some of you; maybe it was just yesterday, maybe this morning… that’s wonderful. But for some of you it’s been YEARS… or maybe really never. 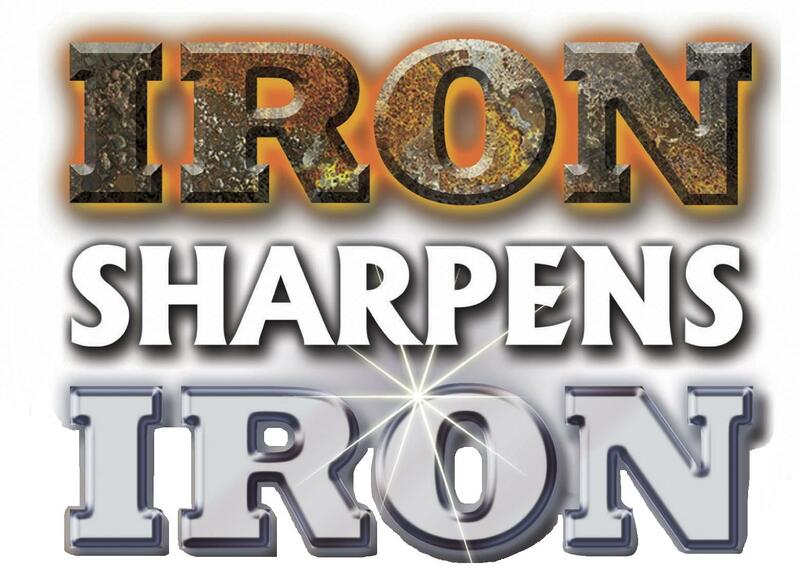 When was the last time that you really felt like “Iron sharpened Iron”… that someone in your life, a brother or sister in Christ ‘sharpened’ you because of your close relationship with them? 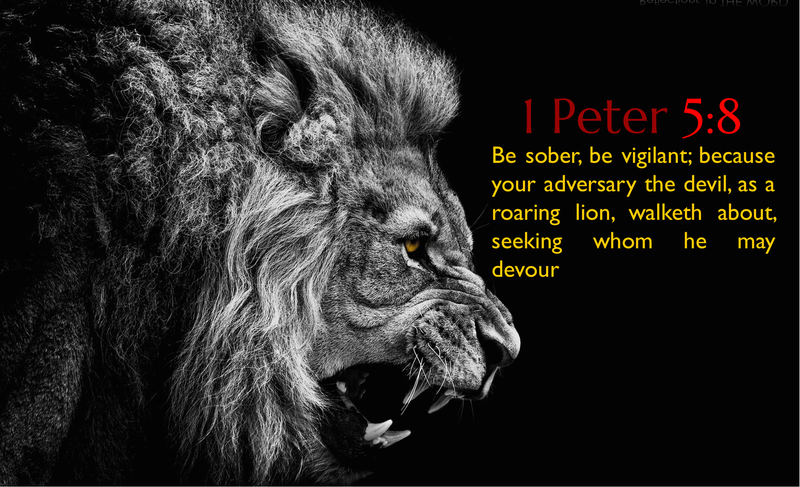 When was the last time you felt like someone else “bared your burdens”… or you had someone that you could confess your sin to, or someone who could confess their sin to you? Friends, these are things that make most of us uncomfortable but they are Biblical and it’s where God is calling us to…these types of relationships. When I looked at this list of things, there were just a few observations that I wanted to share with you this morning… let me put them up on the screen. When I look at this LONG LIST as a WHOLE, the first thing that came to mind was that church services don’t provide these opportunities. Church services do not provide these types of opportunities that God is calling us to; He’s calling us to something more intimate than a public_church_service. How many of you ever been to a church service that tried to run church like a small group… it’s a miserable experience. It’s really bad. 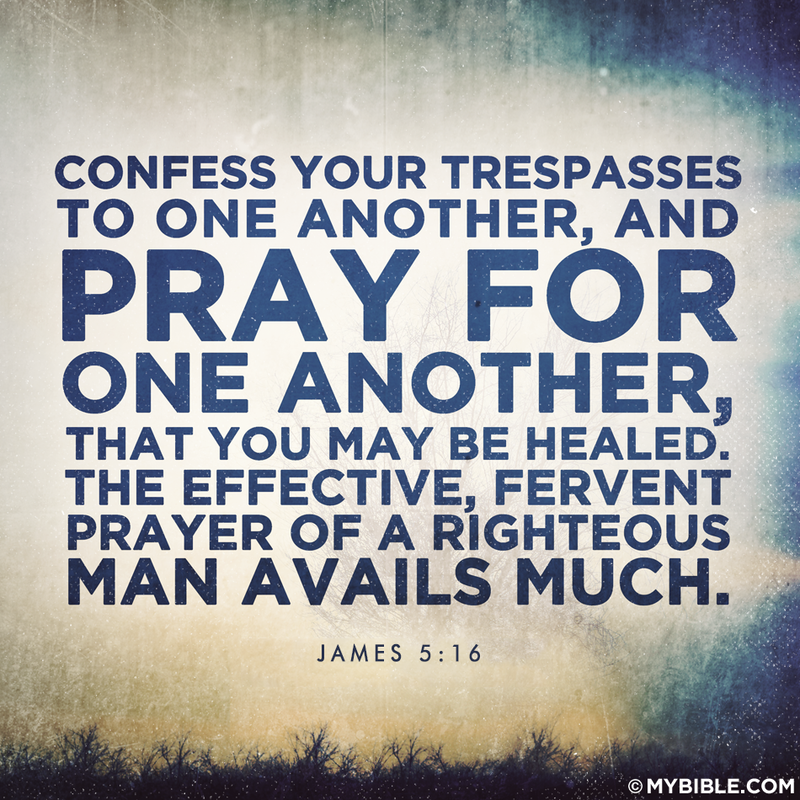 I’ve been called to churches before and one of the first things I did at my last church was stopped having prayer requests in the public worship service. The rumor went around that the pastor doesn’t believe in prayer (Laughter). I’m sorry, but this isn’t a small group, this is a public worship service. So they would get up, and they would start church about… well, kind of like a small group in a Living Room… “It’s around 10, let’s go ahead and get started”... and at 10:07 we might get started and someone would get up and they would share some announcements… and they would say things like “See Sally for…”, and I’m thinking, ‘Who’s Sally?’ … nobody knows who Sally is, you’re assuming that everybody knows everybody. And then they would stop and say, “Does anyone else have any announcements?” And someone would get up and share what they wanted to announce for the group… and I’m thinking, “THIS IS A SMALL GROUP”… this is not a public Worship Service. And then it would become Prayer Time. And then they would say, “Pastor, we want you to share these prayer requests, and then I was expected to say, “Does anyone else have any prayer requests?”… does anyone else have any prayer requests?… etc.”. (LAUGHTER). People would get up and share each other’s business all over the place… and I’m thinking, ‘This doesn’t make sense… this is a public worship service, you’re doing Small Group, Living Room material stuff in a Public Worship Service. It’s not that interesting to be a part of unless you’re already on the INNER CIRCLE. And no wonder those types of churches are dying off and can’t attract people… because when you show up as a visitor YOU really FEEL like an OUTSIDER. Because you’re on the outside of someone else’s Living Room gathering. Have you ever been to one of the churches that try to run CHURCH like a ‘Small Group’? In fact, when I was in college, I we trying out new churches and I went to a Charismatic Church and a pastor said, “NOW I WANT ALL OF YOU TO GO AHEAD AND CONFESS YOUR SINS OUT LOUD“… and I’m thinkin, “I don’t know what these people have been doin’ but I’m in college (LAUGHTER)… no thank you? … right? And I’m not kidding, people started confessing their sins… I don’t know what they said, I couldn’t understand anybody, it was just WEIRD. And I thought, ‘this is just not the appropriate context for this… this does not motivate me in any way at all. The FIRST OBSERVATION when I look at how God calls into a community of faith, is that a CHURCH SERVICE is not the appropriate context to accomplish all of these things–that’s why I believe God is calling us DEEPER, BEYOND just the public gathering in a church service. The SECOND OBSERVATION that I think of when I see this is that we can’t really experience these Scriptures withOUT relationships… that we can’t really experience the beauty of these Scriptures without really knowing other Brothers and Sisters in Christ. It just doesn’t SOUND very good. Have you ever tried to spur someone on that you don’t know very well… you go up to someone and say, “Hey man, I just want to let you know I’ve been prayin’ for marriage”…. and they look at you like, “I’m not married… what are you talking about?” (Laughter). It doesn’t work very well. 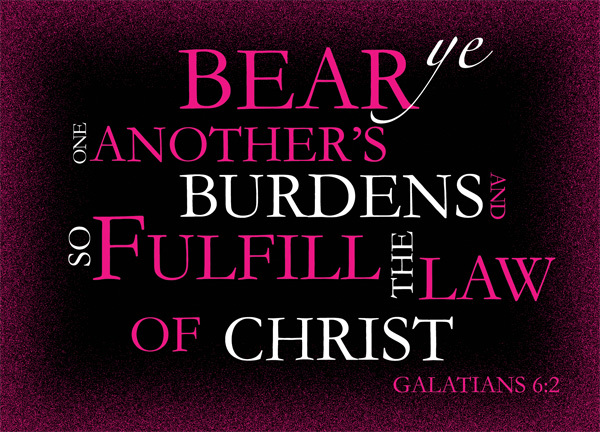 Have you ever tried to bare someone’s burdens that you don’t know really well? I mean when you walk in the hallway, even here in the Fellowship Hall AT church, if you walk by someone, and you say, “HOW ARE YOU DOING? .. What do they say back? … “Well, actually I’m really miserable let’s talk about it” (LAUGHTER). No they don’t… they don’t share their burdens because nobody wants to share their burdens in that kind of context. No one shares their burdens that way… they want to share their burdens with someone they KNOW and they TRUST. You cannot accomplish the things that God has called us to in these passages without really knowing other Brothers and Sisters in Christ. Now I’m going to stop and just challenge some of you… because some of you have come from an ERA and a GENERATION where this type of thing is NOT ACCEPTABLE and not appropriate… ‘We didn’t talk about our “dirty laundry”… we didn’t share our “secrets”… we didn’t tell people we were broken and needed prayer. Well let me tell you something … there’s a lot of things that were wonderful, a lot of reasons why I would’ve rather been alive 30, 40, 50 years ago… but those types of things ARE NOT BIBLICAL. God calls us beyond that cultural norm to a level of intimacy where we SHARE with one another, where we’re OPEN with each other… where we’re NOT AFRAID to admit that we’re BROKEN. Ya know, one of the mistakes that we make at church whether we’re trying to convince people to come to church or to a small group or some ministry we have going on… we always tell people, we always present it from the angle of… HERE’S HOW YOU COULD BENEFIT FROM THIS. YOU HAVE SOMETHING TO OFFER; and we are actually less off without you participating. 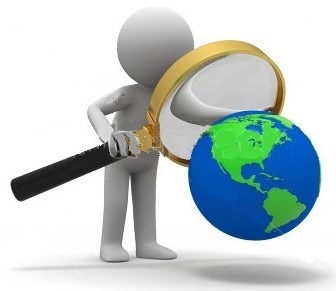 It’s not all about how we can make you better; it’s about us also benefiting from what you have to offer the group. So maybe you’re here today, and I just cannot preach… and the Spirit is just not breaking through your PRIDE to help convince you that you would really benefit and need a small group. And I cannot imagine that there’s anyone in this room who can somehow argue their way around BOTH sides of those and say, “I don’t need a small group” and “A small group wouldn’t benefit from me“. So, ONE of those two HAS to apply. I think they BOTH APPLY for all of us, but it’s a 2-sided thing. I want you to think about the GIFTS and the TALENTS and the things that you might bring to a small group. I want to be clear about the word SMALL GROUP. It’s not the only way to accomplish these Biblical Principles… it’s not like I expect that by the 5 or 6 verses that we read that you become convinced that it’s the Biblical Mandate that you must join a small group at Kirkmont. But I do think it’s the Biblical Mandate that we get connected into close relationships with people where we can DO these things. The CONCEPT of a small group is just how we’re choosing to tackle it and it happens to be how a lot of other churches are choosing to tackle it as well. Ya know the Scripture is reminding us that for those of us who are here today who consider ourselves to be followers of Christ… or maybe you’re here and you’re just wondering what it would be like to be a follower of Christ… that when we transfer our TRUST from ourselves and other people and other things TO JESUS… because of what He has done on The Cross for us… we become part of the family of God. And we not only become Sons and Daughters of the Living God, but as a result of becoming Sons and Daughters of the Living God, WE INHERIT A WHOLE BUNCH OF BROTHERS AND SISTERS IN CHRIST. And some of you grew up as ONLY CHILDREN and some of you grew up with MANY SIBLINGS; and some of you have wonderful relationships with your siblings and some of you not so wonderful. 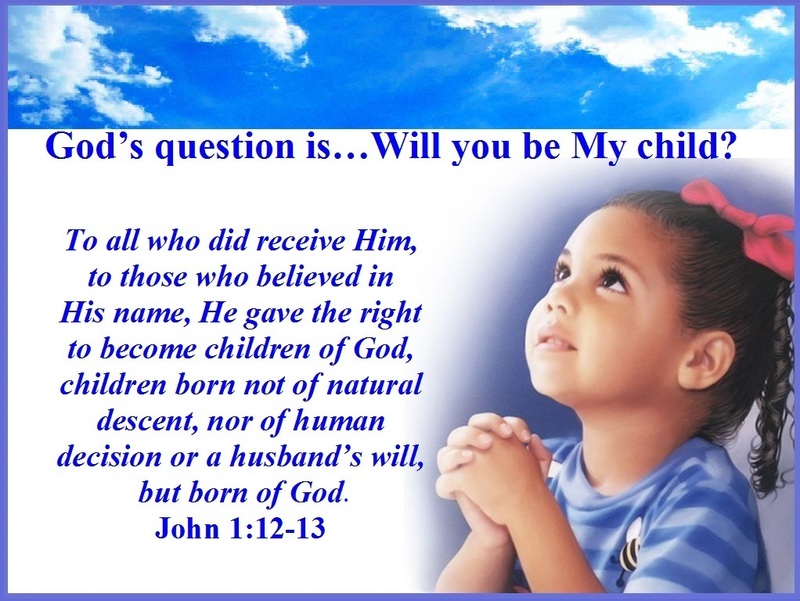 But either way, we have the opportunity to have a new family, a new start, not only by becoming CHILDREN of God, but by INHERITING a group of Brothers and Sisters in Christ around us. And I just wanna ask you to consider the possibility that YEARS ago when you trusted Jesus Christ as your Lord and Savior, you inherited a bunch of brothers and sisters… and you’ve yet to get to know em. You’re not going to get to know ALL of them… but I’m inviting you, I’m challenging you to accept the invitation to get to know a handful of them REALLY well. And to place the value you have with Church Family as the Bible tells us to, ABOVE even the natural relationships that we have here on earth… to ACCEPT that invitation of getting to know those who are in your FAITH FAMILY. Here at Kirkmont, here’s what we’re going to be doing: On September 13th, we’re going to be starting a new Sermon Series. September 13th is by the way when we are changing our Sunday morning schedule from 8:30 and 11… to 9 o’clock and 10:30. Same two services, just two different times. From 8:30 and 11, to 9 o’clock and 10:30 on September 13th. If you haven’t gotten that in writing, we’ve a bunch of handouts on the table ready to get to you… and we will be bombarding you with communication along those lines in the next few weeks. So, September 13th we’re starting a new 6-week preaching series. 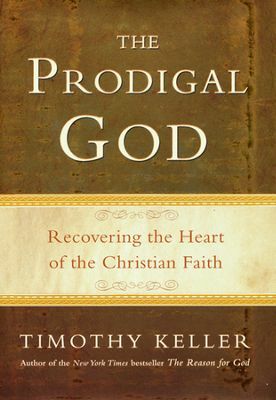 That preaching series is going to be based on the book called THE PRODIGAL GOD, by Tim Keller. The Prodigal God is a book all focused on the famous Bible Story known as The Prodigal Son… it’s a wonderful book by pastor and author Tim Keller; and that’s what I’m going to be PREACHING on. But there’s also Small Group materials that go along with that preaching series. So here’s what we’re going to be doing. First, we’re going to be asking all of our existing Small Groups and Bible Studies to study this material together, at the same time. So the sermon will kick it off on a Sunday; that week any Bible Study that meets will study Week One of the small group curriculum… and consequently Week 2, Week 3 and so on. But in addition to that, we are using this opportunity as in INVITATION to those of you who aren’t already participating in a Small Group, but who don’t necessarily want to sign on for life… to join us for this six-week journey. So we’re going to be starting new pilot small groups, if you will… and inviting you to sign up and commit to coming 6 weeks to join the study. And of course we hope, in the interest of TRANSPARENCY… I’m really praying that some of you will think it’s a great experience and want to keep doing it. But I know that not ALL of you will feel that way… but I feel confident that the majority of you who participate will be REALLY HAPPY THAT YOU DID. So, starting next week, we’re gonna have signup sheets right outside our Sanctuary, showing you all the different Small Groups that we are making available to you… one’s that are already happening that have room in them still… and NEW ONES that we’re starting for just 6-weeks. We want to be clear though, that if you’re not already in a small group… all we’re asking for is a 6-week commitment… and we’d LOVE to see as many people as possible. MY PRAYER… is to see 80% of people who call Kirkmont their home… someday in a small group. Because the things that we’ve talked about are Biblical and foundational… and we might be able to survive alone physically… but not SPIRITUALLY. “Father God… we thank you for Your Word. We thank you for these passages we just had the opportunity to look at briefly together this morning… and reminded us that YOU called us into a COMMUNITY OF FAITH. We thank you that there is a Community of Faith that exists. We thank you that the Gospel has advanced and spread and we have the opportunity to BE with Brothers and Sisters in Christ in a like-minded way. And some of us would like to stop and APOLOGIZE to you and CONFESS to you… that maybe out of our ARROGANCE or PRIDE or something, we have somehow become convinced that we could do the GOD THING alone. And I’m inviting you to present to us an opportunity. I’m asking that Your Spirit would speak to many who are gathered here this morning and prompt them to look at their schedules… to make this series a priority for them and to consider participating and just see how these passages can come alive in their lives. And we ask these things in Christ’s Name… Amen.